Guts is on the trail of the missing Casca. His lover, her mind broken by the brutality of the eclipse, has escaped from her refuge and wanders like a child. Abandoning his quest, Guts has realized what is truly important to him. What does killing Griffith matter if Casca suffers? Around Albion Keep, refugees arrive, fleeing plague and war. The Kushan have invaded the midlands, the Easterners butchering all before them. Starving and needing sustenance, they turn to the church. But Mozgus, the inquisitor, has now sympathy for their plight. He is here to do Gods work, punishing the wicked and rooting out heresy. There is no forgiveness in his heart. All who are wicked are tortured, purified of their sins. In Albion, horrors are performed in the name of God that would rival the acts of the demons of the world. Farness and her Holy Chain Knights are keeping order while a group of prostitutes have taken in “Elaine,” as they call Casca. She’s in as much danger from the church as the demons as she wanders through the suffering in innocence. Can Guts arrive before tragedy strikes. And what does such a gathering of people portend? Have the Godhand summoned them all for the slaughter. The world continues to be brutal as we are shown just how much of a monster Mozgus is while doing “good.” He has found a way to justify his evil in the name of god. He has no compassion in his heart for the starving refugees. They should just do God’s work, even if it means dying. Because their reward will be found in the next life. He’s one of the most depraved characters in the book. If any one is a secret demon in this part of the story, it’s him. And despite that, Miura shows a moment of humanity in him, like he has with many of the monsters. The count, Rosine, and now Mozgus. They don’t seem themselves as monsters even if their actions are horrendous. Human weakness is on full display. Fear and lust, zealotry and flagellation. From Farness to Nina, we’re shown how circumstances bend and twist us. We all make decisions we regret. We all do acts that later horrify us. It takes a brave artist to bare that part of the human soul to the world. This is why BERSERK stands apart from the other fantasy manga out there. It’s powerful and visceral storytelling that any fan of fantasy, especially grimdark fantasy, should read! 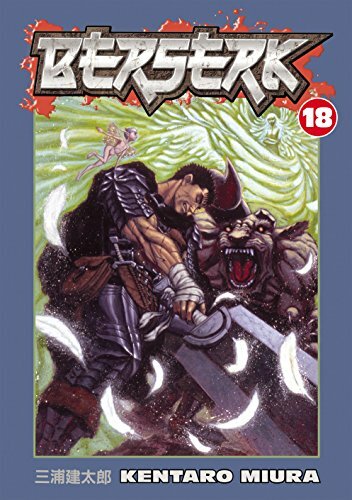 You can buy BERSERK Vol 18 from Amazon.